The Volunteer Supervisor, Community Engagement, is a full-time one-year term position under the supervision of Volunteer Services and Support and Information Line Manager and the Director of Community Engagement. All work at the Sexual Assault Centre of Edmonton (SACE) will reflect the Mission Statement and philosophical beliefs of the organization. The Sexual Assault Centre of Edmonton (SACE) is a not-for-profit, charitable organization that supports children, adolescents, and adults who have experienced sexual abuse or assault, and educates the public about sexual violence. We offer a friendly and warm work environment, and are looking for someone to work Monday – Thursday. Flexibility to work evenings and weekends is a requirement. 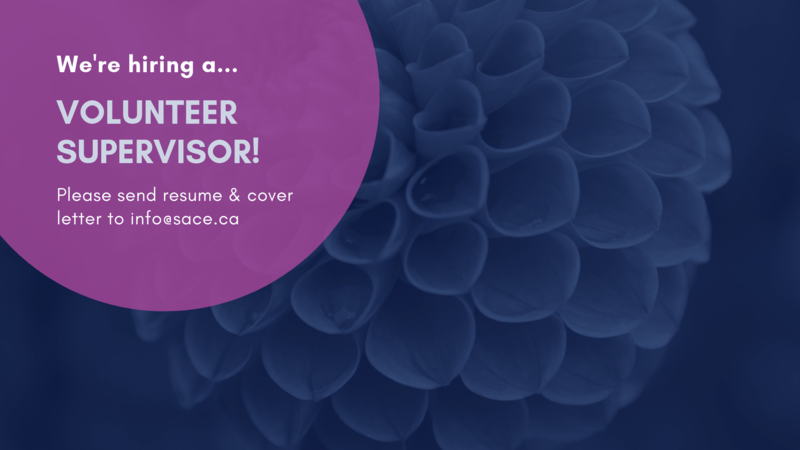 The Volunteer Supervisor is full-time position responsible for the day-to-day operations of the Volunteer Program, as well as supporting the 24-Hour Support and Information Line (SIL) at SACE and Alberta’s One Line for Sexual Violence (One Line). Evaluation of volunteers’ suitability to transition onto the phone, text and chat. Creating and facilitating annual volunteer feedback evaluations. Being available to debrief with volunteers. Completion of SACE Support and Information Line or other similar training is considered a strong asset. Is highly organized and detail-oriented. Interested candidates are asked to submit a cover letter outlining why you think you are the right candidate for this position, with a resume and three professional references. Resumes submitted without a cover letter will not be considered. SACE is committed to hiring practices that support diversity, equity and inclusions. All qualified candidates are encouraged to apply. We encourage First Nations, Métis and Inuit persons; members of visible minority groups; persons with disabilities; person of any sexual orientation or gender identity and expression; and all those who may contribute to a diversity of ideas and practice at the Sexual Assault Centre of Edmonton, to apply. First consideration will go to applicants who have direct experience supporting those impacted by sexual violence, especially those who are familiar with the SACE Volunteer Training Program, or a comparable program. We thank all who apply; only those selected to be interviewed will be contacted.